Discover the charm of our restaurant in the outbuildings of a 19th century château. You enjoy recipes that are simple yet rich in flavour? Then you’re certain to appreciate the Auberge at the camping Château la Forêt, with its traditional dishes and à la carte or set menus. Whether you prefer pizza, meat or fish, and whatever your age, come and enjoy eating exactly what takes your fancy. After all, holidays are made for discovering new flavours! And don’t forget, the campsite restaurant is open every evening throughout the season. Stop off at the campsite bar set in the former stables of the château, and prepare to fall under its charm. In the morning, sit down for breakfast on the terrace or enjoy a simple coffee. During the day, it makes the ideal spot to meet up for a convivial moment together and enjoy your activities in an unusual setting. 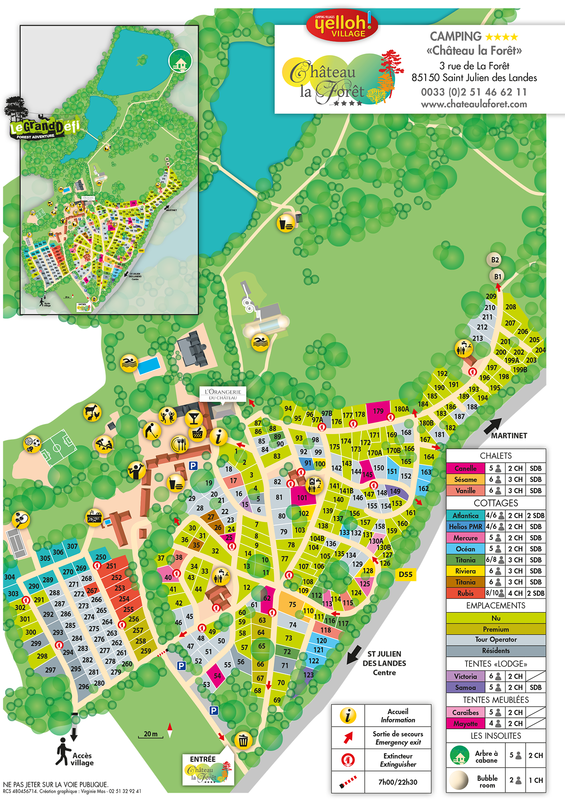 The camping Yelloh Village Château la Forêt offers an opportunity to savour your stay with half-board included! So, make the most of our hotel services to enjoy a holiday truly fit for a king, whilst losing none of the authenticity of your campsite stay. Valid from opening until closing from 26/04/2019 to 07/09/2019. Available on request outside of these dates. Only by prior booking. You don’t fancy cooking? Don’t worry, our on-site snack bar has the ideal solution! Here, the dishes are served quickly whether you prefer to eat in or take away. On the menu: chips, hamburgers and pizzas. All you have to do is sit down and enjoy! A convenient little grocery store stocking all those last-minute necessities can be found within the campsite. Something for your first meals, or perhaps you’re missing an essential ingredient? Don’t hesitate to call in. Bread and newspapers are also available each morning. You need to do some more serious shopping? There is a small mini-market in the village, only 200m away. You also have a supermarket 6km away, open every day in July and August (from 9am to 8pm and from 9am to 12.30pm on Sunday morning).